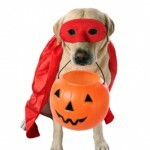 Halloween can be a stressful time for our pets at home. Here are the top 5 tips to make sure everyone has a fun and safe holiday!! The hazards of chocolate are well known but other dangers lurking in those sweet treats include raisins and anything with the artificial sweetener Xylitol. Store treats to be handed out as well as the evening haul in a pet-proof container and out of Rover’s reach. Also be sure to teach the kids not to share their loot with him, no matter how much he begs. Strangers in weird and scary costumes can be very stressful for many dogs. Unless Rover is a spook-proof social butterfly, keep him somewhere safe and quiet during the festivities. Take extra precautions to ensure that Rover can’t bolt through an open front door. If he is mildly shy keep him enclosed in a safe and quiet place such as the bedroom during all the festivities. That goes double for cats who are easily spooked and could even fall victim to Halloween pranksters if they get out. Candle lit Jack-o-Lanterns may be quintessential holiday decor but they are also a fire hazard when paired with large wagging tails. Prevent burns and potential fires by keeping these out of Rover’s reach. Not all dogs love to play dress up. If Rover is uncomfortable in anything but his birthday suit resist the temptation to dress him up (or opt for a simple bandanna or decorative collar). 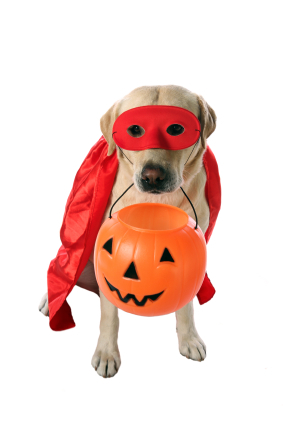 For those dogs who love the attention a costume garners, be sure to choose one that is free of small bits and pieces that could be easily chewed off and ingested.